One-Punch Man is about Saitama: a hero who kills in a single punch. Unfortunately, this has made life incredibly dull for him! The anime follows him as he struggles to find meaning in a world where he has achieved his every goal ...that is until he meets Genos, a cyborg obsessed on being his disciple whether he wants to or not! The following is a fully playable character, or ally, or enemy (if you really hate your players). Download pdf, gcs and TeX here! Basic Speed is set at 375 as the speed of sound is 375.25 and Saitama doesn't cause sonic booms everwhere he goes. 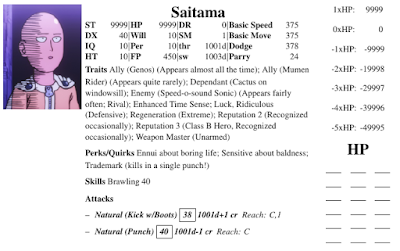 This also gives a dodge of 378, but effective dodge of 16 felt too low, so Saitama has Luck to compensate. DX is set at 40 because higher seems ... futile? At this level he should be able to deal with even -20 modifiers without breaking a sweat! HT and IQ are set to 10 because apart from super speed and super strength (and endurance, more on that later) Saitama seems like an ordinary guy. So much so, that when he and Genos had an eating contest, he couldn't finish without vomiting! FP is tuned up to 450 because in the last two episodes, he has basically an extended fight with lots of monsters, followed by a huge fight which lasts at least 25 minutes with a single opponent basically without slowing down. If we assume he loses 1 FP every 10 seconds, he needs around 300 FP to make it to the 1/3FP cutoff for slowing down. 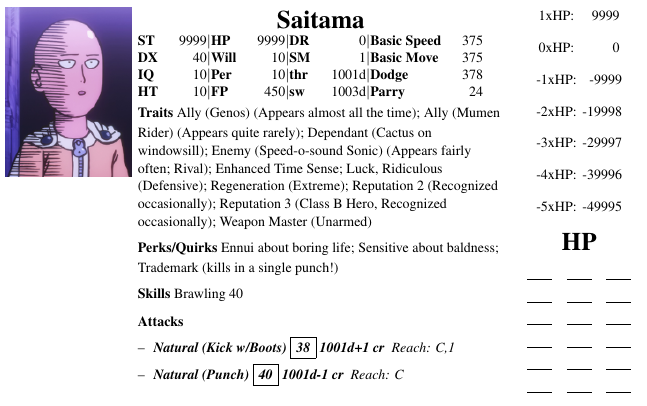 Allies are pretty standard, the high point build of Saitama means that basically everyone is ~ 1 pt enemy or ally. What did you think of this build? How would you have done it differently? Let me know in the comments below!